With all the recent uncertainty and increased volatility, gold has been shining pretty bright over the last few quarters. And, in theory, that should benefit the various miners of the precious metal. But looking at the latest results from low-cost leader Goldcorp (NYSE:GG) shows that higher gold prices don’t necessarily equal improving results, as GG stock managed to report a big miss. All in all, Goldcorp was hit on several fronts, even with average gold prices higher during the quarter. The question now for investors is whether or not the miss and resulting drop in share price represents a glittering opportunity for GG stock or if it’s time to take a pass on the one-time sector leader. This was supposed to be the miner’s year. After what seems like forever, gold prices have finally started to move in a positive direction for the major gold stocks like Goldcorp. With volatility returning and the market’s rally getting a tad bit long in the tooth, gold has once again started to shine and has risen to the critical $1,300-per-ounce mark. For gold stocks like GG, this should have been a godsend. After years of scraping by on low gold prices, the major gold stocks like Goldcorp and Barrick (NYSE:ABX) have reduced costs, shuttered unprofitable mines and driven all-in costs lower. With prices rising, the spread between prices and costs has only grown. So, for GG and its sisters, higher sustained gold prices should instantly boost the bottom line. Unfortunately, that wasn’t the case for Goldcorp. The miner reported earnings per share of just 8 cents. That was well below estimates of 20 cents per share and below what it earned last year during the first quarter. Keep in mind, gold prices were higher during the first quarter of this year when compared to same time last year. Goldcorp should be swimming in profits — and that was the expectation. Well, it was exactly what don’t want to see happen with a gold miner in a rising-commodity-price environment. It produced less at higher costs. For the quarter, GG managed to only churn out 590K oz. worth of gold production. That’s about 65,000 ounces lower than the first quarter of 2017. Moreover, GG’s all-in sustaining costs (AISC) were about $10 per ounce when looking at the two quarters. This is a big problem, as GG wasn’t able to capitalize on the higher gold price and it earned less per ounce on what it did mine. This is exactly the opposite of what you want to see from a mining stock — or any commodity-based stock, for that matter. Long-Term Problem for GG Stock? The question is whether or not this is just a short-term blip for the gold stock. 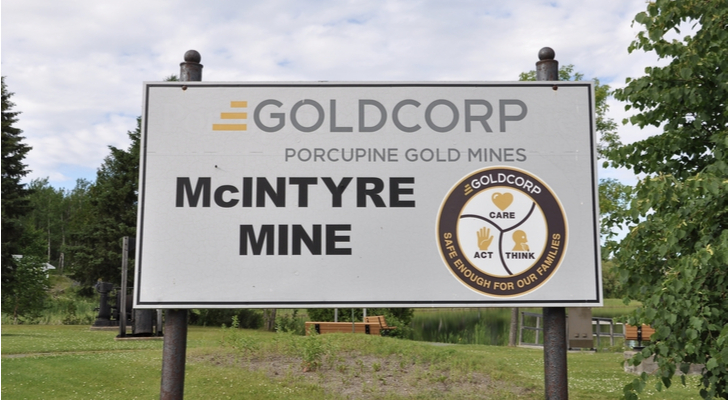 For years, Goldcorp has been known as the lowest cost producer with resource-rich mines. That hasn’t necessarily been the case since the gold implosion and recent return. Smaller rivals like Agnico Eagle Mines Ltd (NYSE:AEM) have stolen much of GG’s thunder — not to mention investor dollars. Shares of Goldcorp finished down about 6% in 2017. This is why Goldcorp announced a massive strategic plan at the end of 2016 to enhance its value and boost returns. The miner’s goal is to achieve a 20% increase in both gold production and its overall reserves. At the same time, GG wants to reduce its AISC by about 20%. The idea is to get its share price to closer to its book value — which Morningstar estimates is around $27 per share. Under that 20/20/20 framework, GG’s latest quarter doesn’t exactly look exactly promising. The quarter seemed like a re-hash of the firm’s problems since the gold bust back in 2012ish. Even worse was the fact that gold prices have been higher. There is some hope on the horizon. Management expects to score around $250 million worth of sustainable annual efficiencies by mid-2018. Those efforts are reportedly on track. At the same time, the firm’s three big projects — the Peñasquito Pyrite Leach, Musselwhite Materials Handling and its Borden mine — are all on track for commercial production by the end of 2019. These projects should help boost GG’s production and, hopefully, its profits as gold prices rise. For Goldcorp, the last quarter was more of the same. The miner has continued to struggle for what seems like years now as gold prices have stalled. With prices rising and the firm still not booming, it makes it harder to get super excited about owning GG stock. Yes, it’s profitable. And yes, it has a plan to boost growth. But we’re a year into the plan and we’ve actually seen the company take a step backwards. That doesn’t exactly make me want to shell out my hard-earned cash for ownership in the miner — especially when others are starting to see some real results. In the end, GG stock could be a hold. It’s cheap enough and does pay a very small token dividend. Hopefully, it can get its act together by next quarter. Until then, new investors may want to take a polite pass and bet on another miner. Article printed from InvestorPlace Media, https://investorplace.com/2018/04/not-so-golden-quarter-goldcorp-gg-stock/.